Had to do it, after all it is National Blueberry Pancake Day AND I had some of my Homemade Blueberry Vodka and fresh, homemade blueberry syrup staring me down from the fridge. Chill your glass. Fill your cocktail shaker with ice then add the blueberry vodka, lemon juice and syrups. Shake until chilled and pour into your martini glass. Garnish with the fresh blueberries and enjoy. 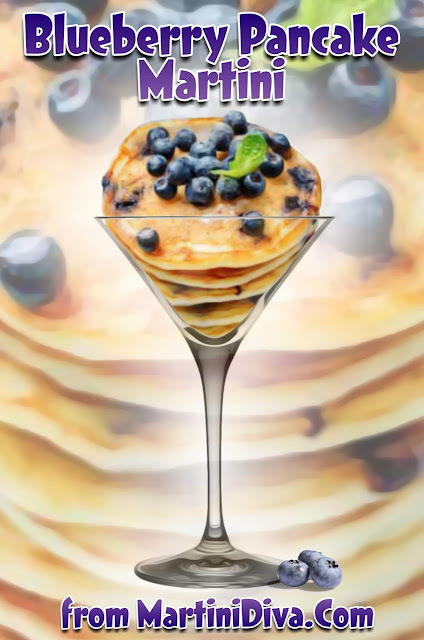 BTW, there is a Blueberry Pancake liqueur out on the market made by Mama Walkers, though I've never seen it or tried it. I'll stick with my own recipe which you can find on the same post as my Blueberry Vodka. National Blueberry Pancake Day is January 28th.